1 / 30 FantaSea Beach House. The beach is your back yard! Beachfront Home! Location, Location, Location! Sleeps 12 in beds!!! 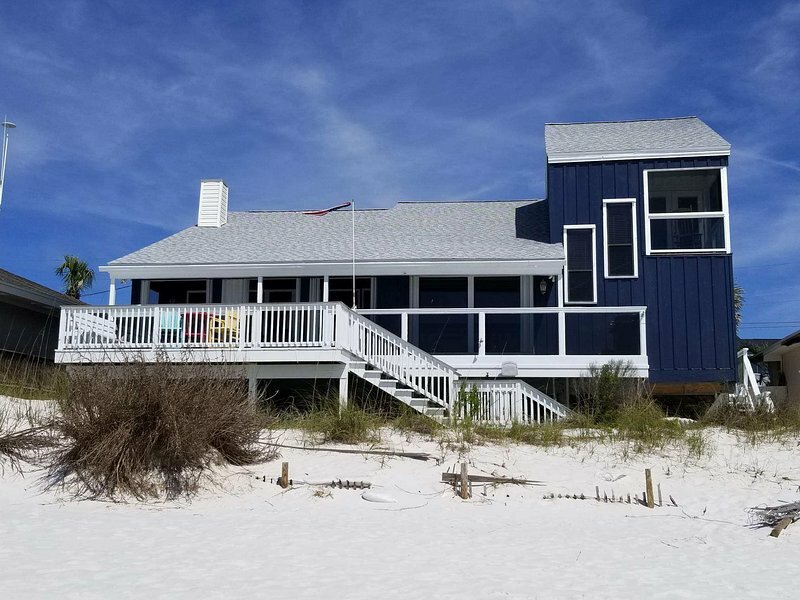 FantaSea is a beautiful 3 bedroom (additional kids retreat accessible through master bedroom) 2 bath home that sits directly on the sugary white sand beaches of Panama City Beach. ZERO steps to the Beach - You are already there! Home is approximately 2000 square feet with fantastic views of the Emerald water. Home has a large open area for entertaining and a gourmet kitchen. There is also a screened in porch off the master bedroom overlooking the ocean. The house also boasts plenty of outdoor space (covered and uncovered) over-looking the beautiful beach and Gulf of Mexico. FantaSea is perfect for enjoying the sound of the waves or cooling off in the Ocean! Excellent layout for large groups! Kitchen is fully furnished with everything you will need. Come make memories and enjoy this wonderful home with your family and friends. Home is located on Spyglass Drive on the East end of Panama City Beach.The home's location couldn't be better; you're walking distance to several restaurants, night spots and a short bike ride to St Andrews State Park. Whether you're watching the sunbathers or the sunsets, you can't beat this view!There bedrooms on the main floor with queen beds and the upstairs Master bedroom has a king bed... there is a kids retreat off of the upstairs (master) bedroom that has one full, two twins, 1 custom (for a small child) and a 27"X80" banquette.Room sizes with queens are 10X9 and 9X12, Master with King is 16X12, and the bunk area is 13X7. In addition, there will be one queen pullout sleeper sofa bed.. Estimated price per night based on a weekly stay. Owner fees of $379.00 per stay may apply. Enter your dates to see the total cost.